For almost 100 years, pilots have been seeing incredible flashes above storms. Scientists couldn’t really explain it until the first photo proving it in 1989. As a storm rages below on Earth, the electrical discharge above the clouds interacts with the ionosphere. The can look like anything from pillars to cones, or even tentacles of a jellyfish, but only last for fractions of a second. Thanks to our space program, NASA has helped uncover this mystery even in the post Space Shuttle era with continuous monitoring on the International Space Station. 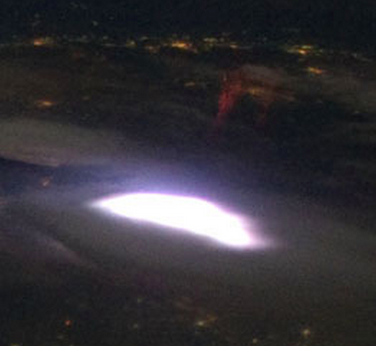 In April of 2012, astronauts in the International Space Station captured a rare view of lightning above the clouds. 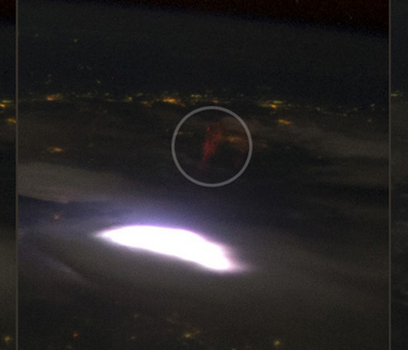 From 250 miles above Earth’s surface, here is a look at the elusive red sprite and jet. Red Sprites: are large but weak luminous flashes that appear directly above an active thunderstorm system and are coincident with powerful positive cloud-to-ground lightning strokes. Their spatial structures range from small single or multiple vertically elongated spots, to bright groupings which extend from above the cloud tops to altitudes up to almost 60 miles. Sprites are predominantly red and they usually last no more than a few milliseconds. The brightest region lies in the altitude range 40 to 45 miles above which there is often a faint red glow or wispy structure that extends to about 55 miles. Below the bright red region, blue tendril-like filamentary structures often extend downward to as low as 20 miles (30 km). Some events are loosely packed and may extend across horizontal distances of 30 miles or more. Their shapes can be variously described as resembling jellyfish, carrots, or columns. Because of their low surface brightness, they have only been imaged at night (primarily with highly sensitive cameras). However, if ones eyes are sufficiently dark-adapted, one can actually detect them without any visual aid. 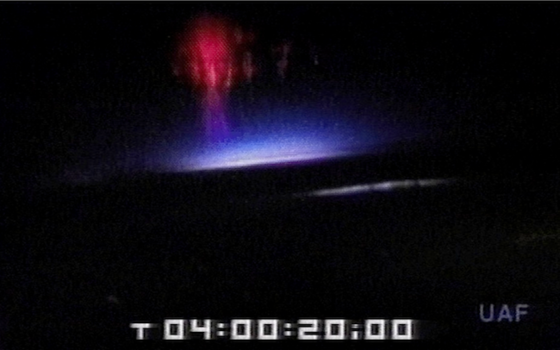 The first images of a sprite were accidently obtained in 1989, although anecdotal reports of “rocket-like” and other optical emissions above thunderstorms go back more than a century. Early research reports for these events referred to them by a variety of names, including “upward lightning,” “upward discharges,” “cloud-to-stratosphere discharges,” and “cloud-to-ionosphere discharges.” Now they are simply referred to as sprites, a whimsical term that evokes a sense of their fleeting nature, while at the same time remaining nonjudgemental about physical processes that have yet to be determined. Blue jets are a second high altitude optical phenomenon, distinct from sprites and first documented in 1994 (although pilots had earlier reported similar sightings). Blue jets are optical ejections from the top of the electrically active core regions of thunderstorms, but not directly associated with cloud-to-ground lightning. Following their emergence from the top of the thundercloud, they typically propagate upward in narrow cones of about 15 degrees, fanning out and disappearing at heights of about 25-30 miles with a lifetime of a couple of tenths of a second. Elves are rapidly expanding (up to 300 miles across) disk-shaped regions of luminosity, lasting less than a thousandth of a second, which occur high above energetic cloud-to-ground lightning of positive or negative polarity. Elves most likely result when an energetic electromagnetic pulse (EMP) propagates into the ionosphere. Though they can be accompanied by sprites, the causative mechanism is of an entirely different nature. Predicted to exist in 1991and discovered with a low-light video camera aboard the Space Shuttle in 1992, elves got their name as an acronym for Emission of Light and Very Low Frequency perturbations due to Electromagnetic Pulse Sources.